• Load the texture in during the LoadResources() method. 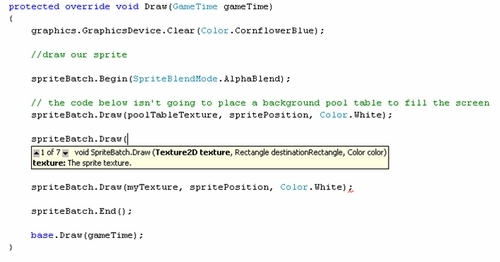 • Display it on the screen during the Draw() method (make sure you add this between your Begin and End spriteBatch calls. • If you can’t see your ball anymore then you’ll need to change the order that the ball and the table are drawn in. • You’ll probably find that our pool table image is a different size from the window size. To fix these last two issues we’ll need a different version of the Draw() method. 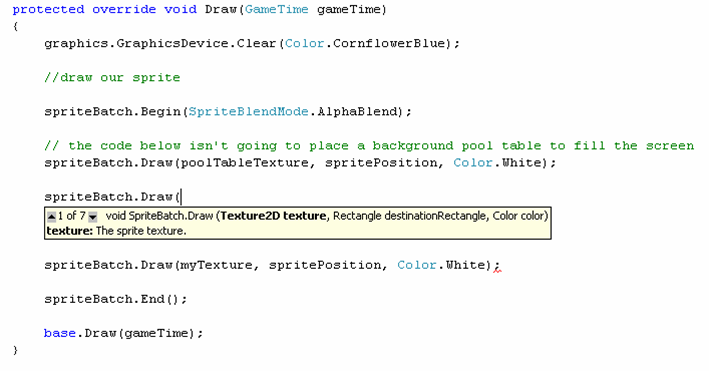 As you can see Intellisense tells us there are 7 different versions of SpriteBatch.Draw. The first one is suitable for our purposes. All that has changed from our previous call is to pass in a Rectangle instead of a Vector2. A Rectangle is used to specify the size that the image should be scaled to when drawn on the screen. Therefore, create a Rectangle that is the same size as our window (mine is 800 by 600) and pass this in to the Draw method. e.g. "spriteBatch.Draw(imageName, new Rectangle(0,0,800,600), Color.White);"